2.5 stars.This was okay, but it didn't end up really grabbing me. I think that's partly due to what felt like a large chunk of the middle being incredibly slow and not particularly needed. There were also an awful lot of bad guys in this book and we got to read all their misguided evilness as they plotted it, which really wasn't all that interesting to be honest and would have had much more of a dramatic impact if we'd been surprised along with the protagonists. It was also annoying because most of these bad guys ended up being completely superfluous to the plot. (view spoiler)[Foln could have been cut completely. Not only did his crazy city-stealing stunt have zero lasting impact since the Convectorate were already on the way to obliterate New Keledon, his "Humans Rule 4EVAH!!" role was shunted to the psychic imprint of his own yet to be resurrected grandfather, the original Sarafin rebel who orchestrated the downfall of his own people because he was a xenophobic, rabidly zealous, power-hungry freak. Drathir, after all that build-up, ended up being simply "reprogrammed" in to one of the Widow's lackeys before he could get any of his evidence out to those who could use it and even worse he managed to get all the suspicious doubters he knew about, and his top operatives, neutralised as well! What was the point of watching him finangle everything if he was just going to be turned in to a useful puppet to ease the Widow's direct face-to-face manipulations of the Convectorate?In fact the only plans we haven't been made aware of were the Widow and Krucius Foln's, and that's because one of them is temporarily dead and the other has been pulling the strings and playing top dog for over a century. Which honestly didn't come as a complete shock to me given that from the start Jen was painting the Widow as a rather unsympathetic and ruthless Mistress with the power to make life unpleasant for any of her Spiders that failed her. (hide spoiler)]Sadly I also didn't really care for the protagonists much. To me they always felt distant or just outright unlikably, I mean, for a great part of the book Jen is a loyal and dutiful underling to the Convectorate who has little to no remorse over any actions she takes. Markus comes across as an idealistic and naive fool, blinkered to the Mire's negative traits simply because he wants them to be the "good guys". Selaris is a star-struck child, whiny and out of her depth most of the time (though she improved towards the end). The alien council were all incompetent, complacent idiots too busy playing at the game of politics and fostering angry resentment towards the people making it possible to live their current lives to do anything particularly useful. In fact I think the only character I really liked at all was Thexyl and he didn't really do much other than repeatedly pull Jen's arse out of the fire when she jumped in feet first and be the voice of reason that everyone ignored.The world building was also meh, with no real explanations for anything beyond everyone hates humans because the Dominion (human empire) basically enslaved the nearby parts of the galaxy and ruthlessly crushed any resistance. This doesn't explain why humans and only humans have psychic powers, who originally forged humanity in to a weapon, and how they managed to rapidly expand and consolidate their influence after helping to overthrow the previous iteration of the Convectorate. Nor does it do a good job of explaining how the Convectorate managed to regain all their lost power with minimal resistance when they only had a handful of indoctrinated psychics and several independent not-very-friendly empires also on the scene.Despite coming across as distinctly underwhelmed, I do have to say that the writing itself was actually not that bad. Very few typos or grammatical mistakes (unlike myself) and honestly had all the extraneous material been taken out and the plot tightened up this would have been a rather exciting rebel underdogs against the evil empire type story without actually treading on Star Wars toes.I may end up skimming the second book to see how things turn out, but right now I'm not really interested in picking it up for a proper read. Well done. A complex tale of betrayal and misperceptions. Several main characters exhibits high hopes and conflicted motivations--often toward each other.Could have tightened the telling by cutting out some of the repetition. It's enough for us to know that people don't trust each other, often for the wrong reasons, without detailing the history of why EVERY TIME the character anticipates some action. A very good read. Jenavian Vale is a Spider, trained to use her psychic powers to maintain security for the Convectorate. But her next mission may turn out to be her last, when she comes face-to-face with Markus Coveri, the only Spider to ever defect. And he is on his own mission, one that may very well be the last hope for the human species, if it doesn’t destroy everything first.This space opera has it all: adventure, drama, mystery and enough gadgetry to satisfy most SciFi fans. 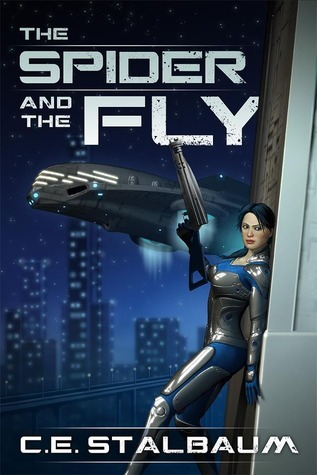 Well written with a fast, tense pace, The Spider and the Fly delivers a great, fun read. Stalbaum creates a believable universe in which humans are no longer the dominant species, and the results could be disastrous. I recommend this to any SciFi buffs. No heavy lifting required, just relax, read and enjoy. I'll be looking for more in this series. classic space opera with excellent, well developed characters and an interesting cast of good guys, bad guys and aliens in both categories with the bad guys not quite as obvious as first seems. Main female character seems to fall a bit on the side of the bad guys although indications are that may change in future books in the series and the hero is definitely a good guy.Good story that had a beginning, middle and a reasonable ending, though there will obviously be more to come. I definitely enjoyed this one, liked the psi touches and the alien interactions. Free today, 22nd of May 2013, on Amazon. Get it here. An interesting story where humans are feared by the aliens and several factions are competing for power. The main characters were well written even if one was initially not that likeable. I love those types of characters that start out being hated and eventually come through as one of the good guys. For me, I initially struggled a bit with putting together the various players and figuring out who was who and what had transpired in the past to create the present situation. It came together for me in the last half of the book. I'm looking forward to reading the next book and I'm hoping we learn more about the widow and see how things transpire. DNF at 35%. It took me about a month to realize that I wasn't going to finish this, seeing as I wasn't really interested in whatever was going on. 35% felt like a whole book in itself - with chases, escapes, kidnappings, reveals, etc. etc. - and I was tired to even think about what would come next. I like my dose of space opera, but the whole world, and, by extension, characters, seemed so detached and unfamiliar that it was hard for me to form any attachments. All in all, it was too much and too little. Shame, really. This was a very poor sci fi read for me. So poor in fact I did not finish it. Did skip to the end to see if what I thought would happen, happened. It did and laid the groundwork for sequels. Not for me at all. Too many characters with too many sub-plots to try and keep them all straight especially since I really did not like any of them. This book captured my interest right at the beginning with some great action and promise of some interesting new ideas. However, towards the middle it slowed down and I hard a hard time staying focused. In fact, I put the book down for about a month, however, I'm glad I gave it another chance, as it picked up in the end. This was a good old-fashioned space opera, with a similar feel to Star Wars. The characters were interesting and complex. It had plenty of twists and turns to keep you guessing, and lots of action. Looking forward to the second installment. Tight sci-fi story with lots of action. Set in a future where humans have lost power in the Universe and a group of them with psychic powers are looking for the cure for a disease that robber them on their powers. Twists and turns and leaves you wondering what the next book will reveal. A nice action scifi adventure book with interesting characters, but I did get a little lost in the history the fed into the conflicts in The Spider and the Fly. Pretty good overall, though, and I'll be looking for the next book. Just recently started reading Sci-Fi and Space Opera's. This was definitely a good read with enough turns to keep my attention. Timeless thought provoking scifi... an enjoyable read. Very entertaining! It has a sort of Star Treky feel to it. The writing is smooth and it moves quickly. Good epic!I love the space opera genera and this one does not disappoint! Fast paced book with a well thought out plot. And a few twists to keep one guessing. Good Sci Fi adventure story with minimal cheese and over explanation.